Scarlet Halle Adams and Lady Bulldog Addison Arlint battle for a rebound. Warrior Cody Tanner lays it up for a score. 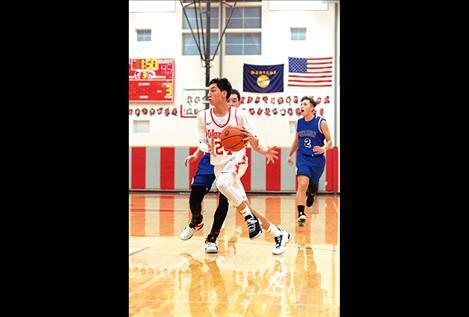 Warrior David Haynes sprints to the hoop. Lady Bulldog Azia Umphrey shoots a couple at the charity stripe. Back on Tuesday, Jan. 8, Mission hosted Arlee in the season’s first rivalry matchup for the two schools. 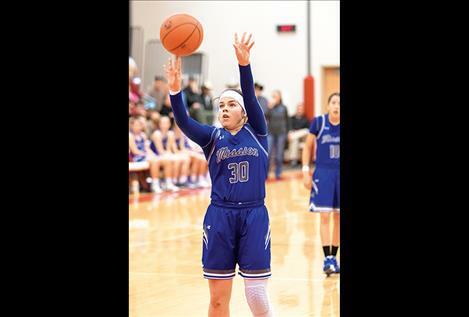 The Arlee Warriors walked away with a 74-59 victory over the Mission Bulldogs, while the Mission Lady Bulldogs won a close 68-65 hard-fought battle with the Arlee Scarlets. 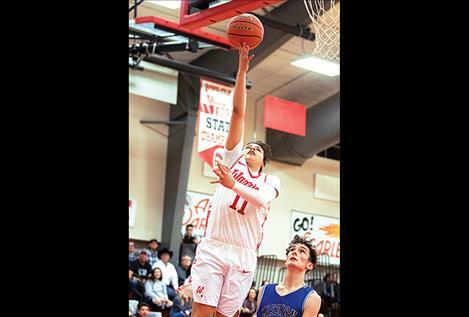 In the Arlee hosted showdown, the Lady Bulldogs once again prevailed over the Scarlets 61-57 in overtime, while the Warriors outran the Bulldogs 100-67. On Thursday, the Lady Bulldogs raced out to a dominating 14-2 first quarter lead against the Scarlets. In the second quarter, the offense for the Lady Bulldogs cooled down a bit as both teams headed into the locker room at the half with Mission up by 10 points, 26-16. Through the third quarter, the Lady Bulldogs maintained their 10-point advantage. Arlee took a 49-46 lead with less than a minute left after going on a 23-12 scoring run in the fourth quarter. Lady Bulldog Karolyna Buck made a three-point shot in the waning seconds to send the game into overtime. The Lady Bulldogs outscored the Scarlets 12-8 to take the 61-57 road win. For the Lady Bulldogs, Buck scored a team-high 13 points followed by Azia Umphrey and Sydney Brander who both scored 11 points apiece. 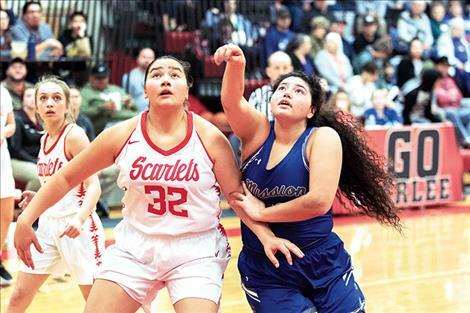 Alyssia Vanderburg, who led all players with 30 points, accounted for one-half of the Scarlets’ offense, while Nellie Desjarlais contributed 11 points. In the boys matchup, the Warriors jumped out to a 21-13 lead after the first quarter and never looked back as they sprinted to a 100-67 win over the visiting Bulldogs. Greg Whitesell finished with a game-high 30 points for Arlee, while Isaac Fisher was second on the team with 21 points followed by Cody Tanner with 11 points. For Mission, Flint McPherson had a team-high 19 points. Lucas Vanderburg ended the game with 13, while Jedi Christy chipped in with 11 points.